The Nursery Jaws® JR is built to the exact standards of it's big brothers, but with the smaller landscaper or nursery in mind. It is the perfect match for a small to mid-size loader and makes a one-person operation out of your landscaping jobs. Like all the Nursery Jaws®, the Nursery Jaws® JR tackles all of your material handling needs. 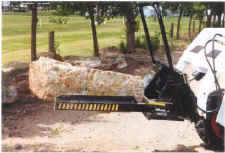 B&B, containers, boxes and boulders are all easily handles with the Nursery Jaws® JR. Compact for greater maneuverability and more precise handling of smaller stock. B&B trees up to 36"
"Just a note to let you know how pleased we are with the Nursery Jaws® JR we purchased from you recently. 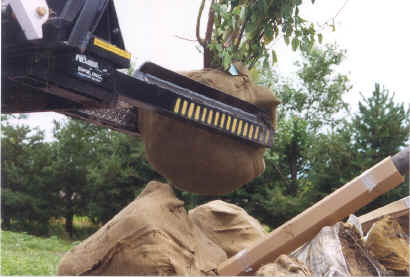 For years we loaded small root balls by hand or with a skid loader bucket. Now we can load and haul root balls much quicker and with less labor than before. It definitely makes us money. As a matter of fact, we just purchased a second unit. Thanks again!."